iPad app update coming soon. We have done a lot of optimisations in the background of sync in this release to handle emails with ‘strange’ headers/properties and for mail servers that respond with non-standard responses. We’ve also implemented a number of security enhancements that streamline our patching processes. We released a hotfix today to address an issue that was causing multiples of the same email to appear in users mailbox sync folders for particular emails. While there was only one copy of the email in Soup Mail, it was sometimes appearing multiple times in the users sync folder in their mailbox. This was impacting some users who are syncing to Exchange 2003 servers over IMAP, because it was occasionally reporting malformed message-IDs. The hotfix has resolved this issue, however, you will need to manually delete the duplicate from your mailbox if you have been impacted. Otherwise you can happily ignore the duplicates and sync will clean them up after they pass your recency window defined in your Soup Mail sync settings. Please click the link below to download and install the latest Outlook Add-in, you will be required to restart Outlook after the install. Added the ability (for team admins) to update tags on emails (use the pencil icon at the right hand side of the mail preview). Favouriting a folder now immediately queues creation of the folder in your mailbox (no more waiting for the next sync for it to appear in your mailbox). You can now download the Outlook Add-in directly from the login screen and getting started links. The add/edit folder screen has been updated and now maintains the scroll position on the page. Sync has been further optimised to better handle very large emails on mail servers with slow connections. 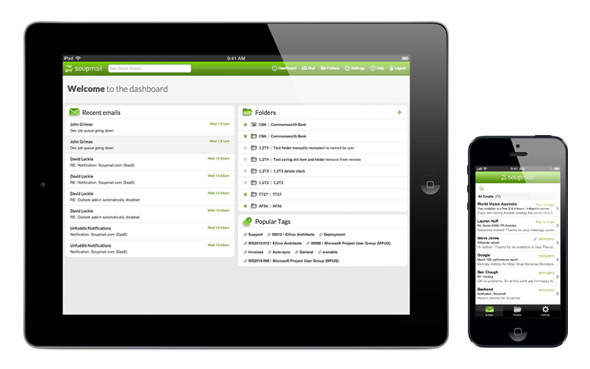 The search index has been optimised to handle on-boarding scenarios that previously required a team to be re-indexed. Updated edit folder screen to search on email address and user name when adding a new sharee. Updated mail preview to handle emails with non-standard CSS styling. Updated mail preview to show place-holders for insecure content. Updated mail preview to enable clickable email addresses. Updated sync to handle emails with non-standard encoding. Over a dozen other platform, security and performance updates. Soup Mail is now back online after the 1.2 update! Sync is playing catchup to process all the emails saved during the update process. But will be back to firing on all cylinders by tomorrow morning. As always, send us a mail at support@soupmail.com if you have any questions. This has been our most requested feature and we are excited to announce that you can now sort on any of the columns on the folder page to help you browse your folder list much more easily. You can also go straight to your favourites by clicking the ‘star’ icon. We have kept the default sort to the Updated column so that all your folders with recent activity are still at the top. We value simplicity, and we know much a little bit of information can help the new users on your team. Here is a small selection of the new juicy icons and tips you’ll find as you move around the app. There is more to come and in particular we will be providing more help on the Mailbox connect page in the future because we know that is the most complicated part of the Soup Mail on boarding experience. The team has made a number of improvements to sync which means it is now faster and smarter. We have full support for mailboxes using IMAP prefixes to help out those advanced GMAIL and IMAP mailbox users. When connecting your mailbox to Soup Mail you’ll notice that it will create the Soup Mail folder immediately and also give you feedback if it failed to connect because your username or password was incorrect – this should save you having to dig into the advanced settings if you just mistyped your username or password. You will notice a new banner at the top of the mail preview when the content of the email contains links to remote sites or non-secure (non https) resources. You will need to click the “Show Remote Content” link to display the remote content (typically images). We have done this to help protect your privacy. You can now delete emails from Soup Mail again. For those earlier adopters, you will remember you could originally do this but sync was putting them back in when it discovered the emails in another user’s sync folder. Well, sync is now much smarter (and faster) and you can now happily delete emails from Soup Mail, just click “X Delete email” when previewing an email. With the Soup Mail Add-In file your emails with one click from Microsoft Outlook. Go get the latest version of the Soup Mail Add-In for Microsoft Office Outlook! 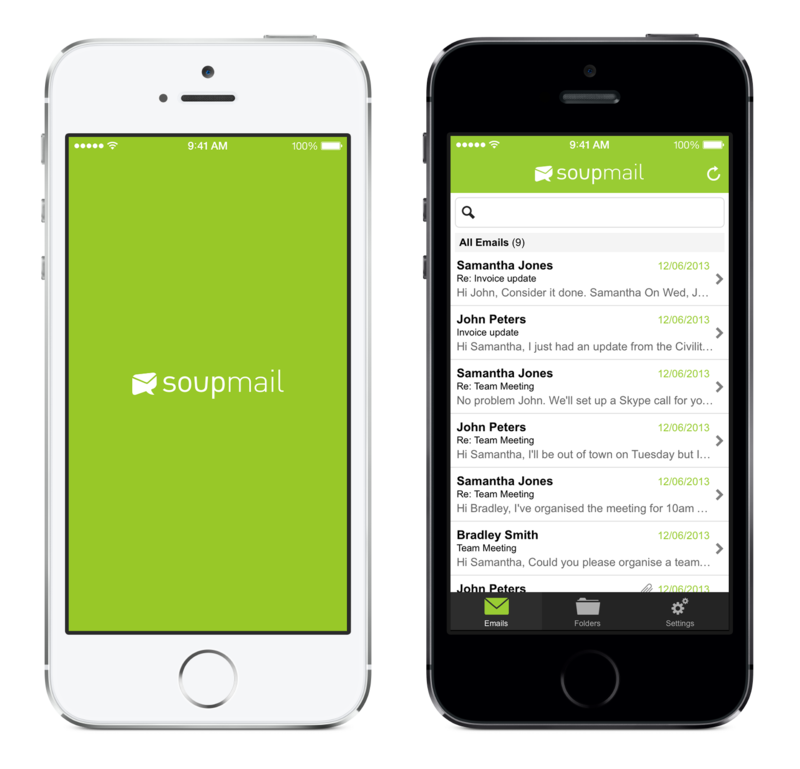 Today we’re really excited to announce the release of Soup Mail for iOS. With just a tap, you’ll be able to scroll through your team emails anywhere you are! On the iPad you can manage your team, create folders and everything else you could expect to do in Soup Mail. You can get your email filing sorted and have your entire team’s emails on hand whenever you need it. On the iPhone you can find those emails you need follow up quickly and browse your folders. 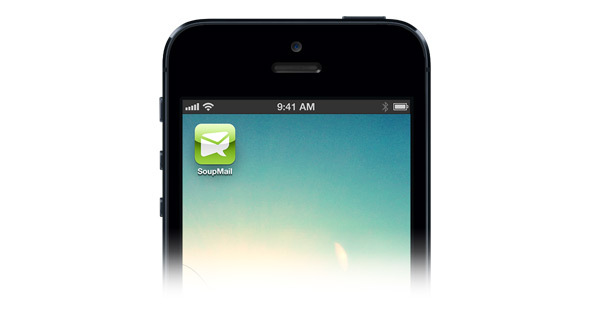 Go get the latest version of Soup Mail for iOS! 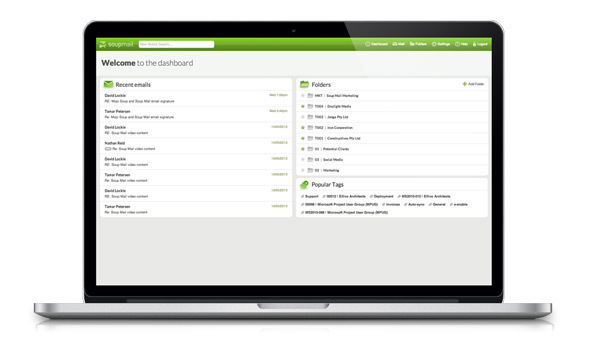 Soup Mail allows your staff to view, share, search and manage emails like they do other electronic files. And it simply integrates with your existing email and desktop technology.